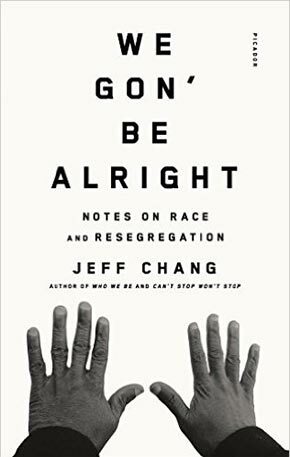 JEFF CHANG’s first book was the award-winning Can’t Stop Won’t Stop: A History of the Hip-Hop Generation. He has been a USA Ford Fellow in Literature and was named by The Utne Reader one of “50 Visionaries Who Are Changing Your World.” Chang has written extensively for The Guardian, Slate, The Nation, The New York Times, The SF Chronicle, The Beliver, Mother Jones, Slaon and more. He is the Executive Director of the Institute for Diversity in the Arts at Stanford University. Known first as a critic/journalist of hiphop music and culture—his Can’t Stop Won’t Stop (2005) won the Before Columbus Foundation’s American Book Award—Chang expanded his purview in 2014’s Who We Be: The Colorization of America to consider larger issues of social history and multiculturalism in America. Here, he wonders why we keep talking about diversity even as society is resegregating both racially and economically, considers how culture influences politics, and looks at the return of student protest today. Race. A four-letter word. The greatest social divide in American life, a half-century ago and today. During that time, the U.S. has seen the most dramatic demographic and cultural shifts in its history, what can be called the colorization of America. But the same nation that elected its first Black president on a wave of hope—another four-letter word—is still plunged into endless culture wars. How do Americans see race now? How has that changed—and not changed—over the half-century? After eras framed by words like “multicultural” and “post-racial,” do we see each other any more clearly? Who We Be remixes comic strips and contemporary art, campus protests and corporate marketing campaigns, Martin Luther King, Jr. and Trayvon Martin into a powerful, unusual, and timely cultural history of the idea of racial progress. In this follow-up to the award-winning classic Can’t Stop Won’t Stop: A History of the Hip-Hop Generation, Jeff Chang brings fresh energy, style, and sweep to the essential American story. Hip-hop is one of the most important art movements of the past two decades, having moved beyond rap music to transform theater, dance, performance, poetry, literature, fashion, design, photography, painting, and film. • Greg Tate, Mark Anthony Neal, Brian “B+” Cross, and Vijay Prashad on hip-hop aesthetics in the wake of multiculturalism. • Joan Morgan and Mark Anthony Neal discussing gender relations in hip-hop. • Rock Steady Crew b-boy-turned-celebrated visual artist DOZEon the uses and limits of a “hip-hop” identity. • Pioneer dancer POPMASTER FABEL’s history of hip-hop dance, and acclaimed choreographer Rennie Harris on hip-hop’s transformation of global dance theatre. • Bill Adler’s history of hip-hop photography, including photos by Glen E. Friedman, Janette Beckman, and Joe Conzo. • Poetry and prose from Amde Hamilton of the Watts Prophets, Staceyann Chin, Suheir Hammad, Marc Bamuthi Joseph and Kevin Coval. Forged in the fires of the Bronx and Kingston, Jamaica, hip-hop became the Esperanto of youth rebellion and a generation-defining movement. In a post-civil rights era defined by deindustrialization and globalization, hip-hop crystallized a multiracial, polycultural generation’s worldview, and transformed American politics and culture. But that epic story has never been told with this kind of breadth, insight, and style. Based on original interviews with DJs, b-boys, rappers, graffiti writers, activists, and gang members, with unforgettable portraits of many of hip-hop’s forebears, founders, and mavericks, including DJ Kool Herc, Afrika Bambaataa, Chuck D, and Ice Cube, Can’t Stop Won’t Stop chronicles the events, the ideas, the music, and the art that marked the hip-hop generation’s rise from the ashes of the 60’s into the new millennium. Here is a powerful cultural and social history of the end of the American century, and a provocative look into the new world that the hip-hop generation created.